Groovefest American Music Festival is Cedar City, Utah’s premiere all music festival and has gotten bigger and better since it’s beginning in 2002! The family-oriented event runs annually the third weekend of June at the Cedar City Main Street Park and other venues in the historic downtown. Since 2002, Groovefest has grown from its humble beginnings as a small handful of music lovers gathered for a few hours to hear music in a back parking lot, to a major four-day festival event with over 30,000 in attendance. Festival-goers come to Cedar City from all over the United States to hear and see performers from all over the world. The Groovefest crew and volunteers transform the park into a full-fledged celebration of outdoor music and fun. Vendor booths selling food, art and gifts set-up and as well as a kid’s corner with inflatable rides. Two stages host over fourteen national touring acts and several local musicians for two days of music beginning at noon and continuing until 11:00 PM both Friday and Saturday. 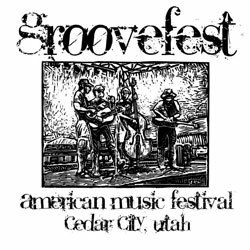 The Groovefest American Music Festival is a five day festival that is dedicated to American music, whether it is Blues & Folk, Bluegrass & Country Western, Americana, Jazz, Jam… well, the list goes on.